Asko Dishwasher Error Codes – How To Clear – What To Check? If your Asko dishwasher is displaying an error code, below we have the solutions for what part needs to be checked. 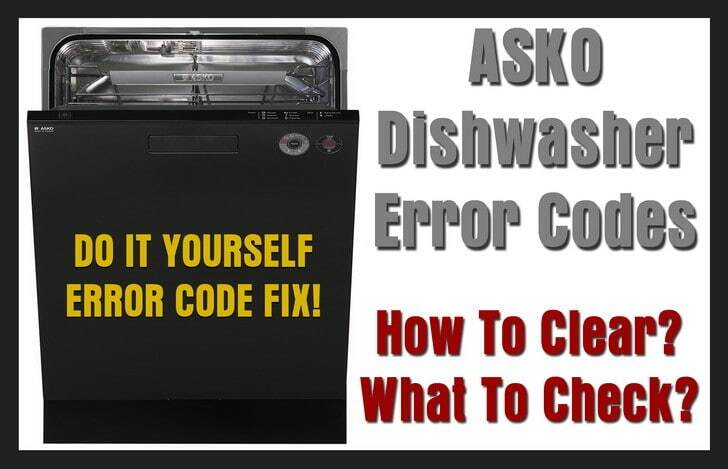 These Asko dishwasher error codes also tell you what parts need to be replaced or have become defective. Use the error code list below to help you to identify your Asko dishwasher error and fix it yourself. If your ASKO dishwasher is showing a different error codes form the ones above, please leave a comment below and we will be happy to help you fix the problem. Dishwasher says “LOC” and shoes a lock symbol when trying to turn it on? Im getting an F10 error message. Over filling. How do i clear this. ive emptied out the water and no more is coming in but i cant use it until its clear. The water is trying to pump out even when its not turned on at the machine. My Asko dishwasher comes with error f12. But i takes water in and then it stand-by fore abort 20-30 sekunds and then f12 failure code comes. So if The f12 code means there is an failure on water intake but it takes water in – What Can The failure be then? I hope you Can help me. recently purchased a new home with asko dishwasher D5131 (possibly 8 years old). Been working fine but now stopping after 2 minutes and flashing F7. Any ideas?? Asko D5233 Dishwasher starts as normal then 2 minutes later cycle just stops. When I open dw the panel lights on Aut and Heavy wash (the big sized pot symbol) are flashing. I have an Asko Diswasher type DW 90.2. The LCD displays an opening door. There are no error codes. I have tried unplugging and plugging back in to clear it. Power button, program button all cause the LCD to show an opening door (animated). I have checked the door clear of obstructions, there is nothing blocking the door from closing all the way. Puzzling. What is the teardrop symbol? Hi my Asko dishwasher is showing F9 and the pumps works but no other function, can you assist and advise what it is. Our Asko dishwasher when turned on has 3 lots of 3 vertical flashing lines. Nothing works. Have tried unclogging drains to no effect. You can scroll through different wash cycles but when you press start button, same 3 lots of 3 vertical lines start flashing again. Had a Asko dishwasher installed today. Model DBI664PHXXLS. After 15′ in the cycle, a red light is blinking, error code F56. Tried several times to restart the cycle, it always ends up with F56. I have moved into a house with an ASKO D5434 dishwasher, purchased in June 2015. It is connected to a power plug, which is operational with other items, but the screen on the dishwasher screen is blank with no light or codes shown. What is required to get the dishwasher to access the electrical supply? My Asko dishwasher is showing broken lines not a code. It was previously showing the F11 code for drainage error. No error code dishwasher showing 1 and seems to be stuck in cycle when I turn off and on it will not respond to any buttons pushed? Help??? Hi Megan – have you found a solution for this? My ASKO is the same right now. I have a Asko dishwasher 18-95. We have recently moved in the house and noticed that the light in the dishwasher inside is constantly on. When looking to the side of the dishwasher, it looks like the side light is also on. Hi I have an ASKO D3122 Dishwasher the power lights are on but the program panel won’t work. ASKO DISHWASHER no warning codes displayed, but a red light is flashing on the lower right corner. I filled the rinse aid dispenser, but is still flashing when dishwasher is running. My problem is on a Asko DW20.4 dishwasher. I’m getting a water outlet fault. I’ve cleaned out the filters and the impeller turns freely can’t feel any blockage there. My ask dishwasher panel is showing LOC with a key and a drip of water. Urgent please. My dishwasher is beeping with an F10 error message. How do I drain it? I have an F12 error code. Water is in the bottom of the machine and won’t empty. Also won’t compete a cycle now. How do I fix the problem please? I have an F2 error code on my Asko D3335. There is water not draining. The float switch is fine. My Asko D3530 won’t clean bottom tray. Top cleans perfect on normal cycle but bottom won’t even rince food off dishes. Arms are clean and clear of debries. No codes. I have ASKO model 1502 for many years and I love it. Never had a problem until now. I have held the ‘start’ pad for 3 seconds and pressed ‘start’. My dishwasher displayed error code F00 after completion. It was continually making the end of cycle beeps. I turned the dishwasher off and back on again and the code disappeared. I have not tried to use the dishwasher again. Can you tell me what this code means please? My Asko dishwasher, model D5634 is giving F11 error code. It is pumping out the water, I can see it and hear it in the disposal. There is a small amount of water left in the bottom of the drain screen but otherwise seems to drain completely. It won’t complete the program after the error. I’m pretty sure its not the hose or pump. Hi Rick, same problem here. I can almost never complete my cycles anymore. I checked the hose, seems ok. I have not dismantled the pump etc, but I doubt this is the problem as it does know how to flush 100%, since it works at the beginning of the cycle. Seems like something is informing the computer that the pumping is not done 100% at a certain point in the cycle, although the levels are ok.
Have you found your solution? PS: this is why I have those computer based interfaces. If this would happen in the old Dial systems, I’d hack my way though by emptying with the start-flush, then push the cycle to the point of rupture. Rick. Did you find out how to fix your F11 error code? Lines ) but door isn’t open or blocked? There was water in bottom of machine when I first saw indicator light . I’ve cleaned all filters inside the unit….. not sure what else to do…. keeps saying door not shut lights ? Our Asko D5424 dishwasher comes up with three horizontal lines where the time should be. Like above but lines closer together. I have an Asko D3351 Dishwasher. Had gone through the wash cycle and has emptied, but it won’t stop trying to empty, and all the lights are on. and their it remained . The only way to stop it is to switch it off . None of the touch screen displays will work. If you switch the machine back on with the door open the screen displays 3 sets of 3 horizontal lines, on closing the door it continues to rinse . Can you help? Thankyou. Have an ASKO D3350 and am getting an F7 error. Trap wasn’t that gummed up, but cleaned everything out anyway. Can reach into the sump and spin the propeller easily enough. From what I can tell there are no blockages. Have even poured gallons of water into the unit then started a cycle to test drainage. Washer is empty within seconds. Will still run for 2 minutes (pump running the whole time) then stop and flash F7. Hello, we keep getting an F11 error on our dishwasher. I have checked the hose and there doesn’t seem to be any blockages. I managed to do a flush with a rinse cycle followed by an empty full cycle with a dishwasher cleaner, but the moment I try do a load with dishes then I get the F11 error. We have had this dishwasher for 6 months. Our previous Bosch Dishwasher we had for 8 years and never had this problem. My ASKO dishwasher will not turn on it is making a clicking drumming noise but lights will not stay in To start programme. They flash on and off briefly. Can you give us the model number of your ASKO Dishwasher? Asko Dishwasher fault code L simply denotes LED. There should be a number next to it. Is it just an L showing on the display or is there a number showing also? My dishwasher will not start any wash cycle and is displaying a water droplet on the display what does this mean please? I have switched off at mains and water inlet is unchanged. My Asko 6441 clothes washer won’t drain. I get an F3 message, and I’ve cleared out the pin trap, checked for kinked hose, and restarted several times. Any ideas? Most likely the drain pump on your Asko washer if blocked or clogged with a foreign object. Unplug the washer and inspect the drain pump, you will most likely find something inside or in the lines near it. Asko dishwasher mod# D5538XLF1 Ser.#124802304439, keep getting a F12 code called Asko service for help. They said to change Control and may be pressure and micro switch. Changed all these parts which were very costly, still getting same code. The dishwasher will drain good and when I start the cycle it will fill o/k then it just stops won’t into next cycle. Asko dishwasher power comes on, program dial illuminates, cannot advance program to desired or electronic button and any buttons are unresponsive. The door is securely closed. Can you supply us with the Model number of your Asko Dishwasher? We can provide further help once we know which model Asko dishwasher you have. Asko D5436wh dishwasher keeps faulting and wont start. Three dotted lines keep flashing up on the screen. Have turned off at the wall and occasionally this will reset it and it works. Have cleaned all filters. Tried to start in different programs. Now wont work at all. Timer may appear on the screen but as soon as you press start. The three lines if three dashes starts flashing. Unit purchased from the Good Guys 22nd Dec 2015. My ASKO is running for about a min of the cycle and then it starts beeping showing F12 code. I see that it means there’s a issue with value of the water but how can I check for this, all the pipes are in correctly, I have the water on properly. Also when I remove the filter there’s some water hanging out in there and it doesn’t seem like its rising or going down, is this normal? The true meaning may be the dishwasher cannot drain properly therefore the water “in” is having issues. Make sure the dishwasher is able to drain properly. Check the bottom sump and surrounding areas for blockages. If nothing, check the pump itself as it can be faulty or clogged. Asko D5456 with F11 error. I’ve checked drainage, nothing seems to be blocked in machine. Can’t get in further to see pipes. Water not draining away. Asko Dishwasher D3530 states “Water Outlet Fault” There is no code that I can see. Have removed collection unit in base and found about 3 cms/1″ of water in there. Felt around, can find no food particles obstructing area. Switched off power, restarted and sign returns. Can someone advise or suggest next steps. Asko Dishwasher D3530 “Water Outlet Fault” = A kinked or restricted drain line. Check to make sure you have no kinks in the drain line. If you have a air gap, check to make sure it’s not clogged and gets good water flow. Check drain tubes from pump to disposal and make sure the inlet hole is clear. My Asko dishwasher panel light is blinking nonstop and the drain pump is running/pumping without stopping. The only way to stop the pumping is to unplug the unit. I do not have an error code display on the front panel. I like to repair the dishwasher myself. What do I need to do, what is the problem? Thank you, Hans. Remove the bottom kickplate to be able to see under the dishwasher. There should be a float right in the center of the unit. The water makes it float and the float presses a switch to run the pump. There may be water down there that is making the float switch activate. If you see water, tilt the dishwasher to drain it. If no water, then something may be stuck and holding the switch in the upwards position. My ASKO dishwasher is displaying a F2 error, i just replaced the drain hose, could this have something to do with it? If it’s the water pump or valve what does this mean and could i repair it myself? ASKO DISHWASHER ERROR CODE F2 = There is water in the drain pan under the dishwasher and this is causing the flood switch to activate which will show the F2 error code. To remove the water at the bottom of the dishwasher drain pan: Pull the dishwasher out or tilt it forward 45 degrees and let the water pour out. If you cannot remove the dishwasher… Let it sit for 3 or 4 days with a fan running through it to try and evaporate the water. My asko dishwasher fills and drains, but will not wash. It gives no error codes. It shows a fault F7. Still goes but times for programmes are incorrect. It shows 31 minutes for the Normal wash.
Have turned it off at the wall and it does correct itself but when we turn it on and commence the programme again it stops halfway and the F7 comes up. Will start and finish the programme when we re push Start but wondering why this happens..
Have looked carefully and it does appear to say F7 and not F1. F7 error on Asko Dishwashers means a draining issue. Remove the lower dish tray and look in the bottom for the filter screen compartment. It needs to be cleaned or replaced if damaged. Food particles, broken dishes, and scaling can clog passageways and will reduce pressure enough to eventually result in inefficient draining. Next post: How To Find Your Dishwasher Model Number And Serial Number?